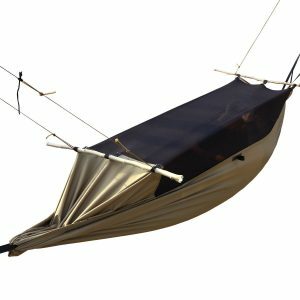 This hammock is waterproof, tear resistant, and keeps from mosquitoes with a net above. Also the tent can be received in the compressive bag, no occupy space, which is easy to carry, much more solid with the sealed stitching of the tent. With this hammock comes four ropes: 2 stout rope(as hammock’s tied rope), each one 6 meters; 2 thin rope (as hanging net), each one 4 meters. The fine gauze prevents mosquitoes, leaves and twigs falling in with the strong fixed triangle, providing tent stability and durability. The hammock is easy to set up on the trees of varying sizes and has a double-sided zipper. There is one more option for you with a larger size. If you want it, please search ‘free soldier hammock’.